Posted on June 2, 2011 by D.J. Wednesday is the day new comics hit the shelves. I sometimes wait until the weekend, but lately my ladyfriend and I have tried to go to a shop the day of, because it’s more fun — like seeing a movie on opening night. This week was a doozy, and three of my favorite ongoing comics had new issues! I got kinda giddy. iZOMBIE (from Vertigo) has been a favorite of mine since it debuted. Almost anything with Mike Allred on art (especially when his wife Laura is doing the coloring) is a must buy for me. I wasn’t as familiar with writer Chris Roberson, but this book has made me a fan. Honestly, I’m tired of zombies, but this one has a different, more fun flavor to it. Lots of character and mystery, far less gore than the cover suggests — and ghosts, a wereterrier (friendlier than a werewolf), vampires, maybe a mummy — loads of shenanigans. 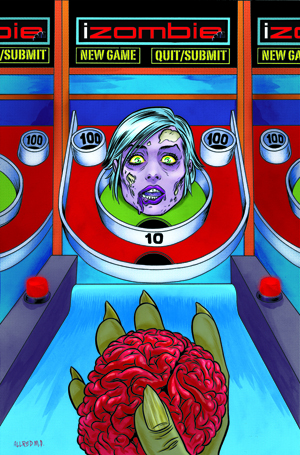 This latest issue also features skee ball, which is just plain fun. If you haven’t read the book, the first trade is out, and I highly recommend it. 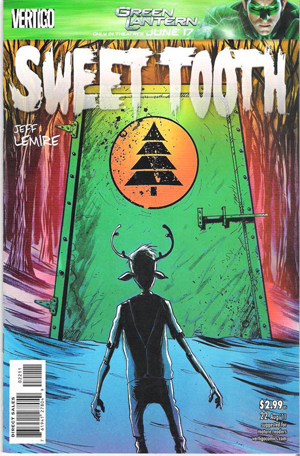 Another one of my faves, also from Vertigo, is SWEET TOOTH by Jeff Lemire. It involves a bit of an apocalypse that results in human/animal hybrid kids, like the titular deer boy Sweet Tooth (real name Gus). This is a bit of a road book, similar in some ways to another favorite, Y THE LAST MAN, only in that respect and in the fact that is excellent. I haven’t read this issue yet, but each issue adds another layer of mystery, heartbreak, and unexpected fun. Lest one think I only read Vertigo books, I also snagged the latest CRIMINAL series, THE LAST OF THE INNOCENT. Ed Brubaker and Sean Phillips are one of the greatest writer/artist teams in comics. Each CRIMINAL series can stand on its own, though every noir adventure exists in the same world. Brubaker and Phillips also do a book called INCOGNITO, a pulpy superhero book, which I finally just read all of (the first volume and the second one, INCOGNITO: BAD INFLUENCES). 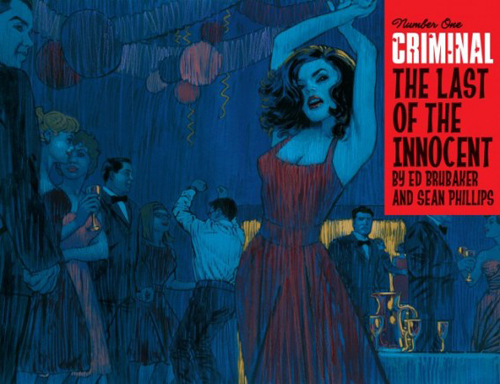 It was great and made me want more Brubaker/Phillips comic act — and lo a new issue of CRIMINAL this week! Almost as fun as the comics themselves is the backmatter in each issue, usually an essay about a film noir accompanied by a terrific piece of Phillips’ art. Each series has been collected, and I recommend any — though I usually like to start with the first volumes, which in this case would be CRIMINAL: COWARD. If you’re reading this, odds are you buy comics, too. If so, what’d you get this week? Any recommendations?